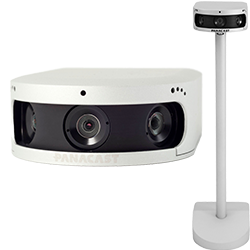 With its ultra-wide field of view of up to 180º wide and Panoramic-4K resolution, PanaCast 2 delivers exceptionally clear video with a natural human visual perspective delivered in real-time. PanaCast delivers a natural video collaboration experience unlike anything you’ve seen before. With an ultra-wide field of view and high resolution video stream, PanaCast gives you a virtual seat at the table. It’s easy to use, portable, and available at a disruptive price point. The perfect solution for Huddle Rooms.